Willows Estate enjoy a corn roast at the Aurora, Ont. long-term care home Aug. 31. Sweet corn fresh from the cob and garnished with real butter is residents to reach for a second helping in more ways than one. 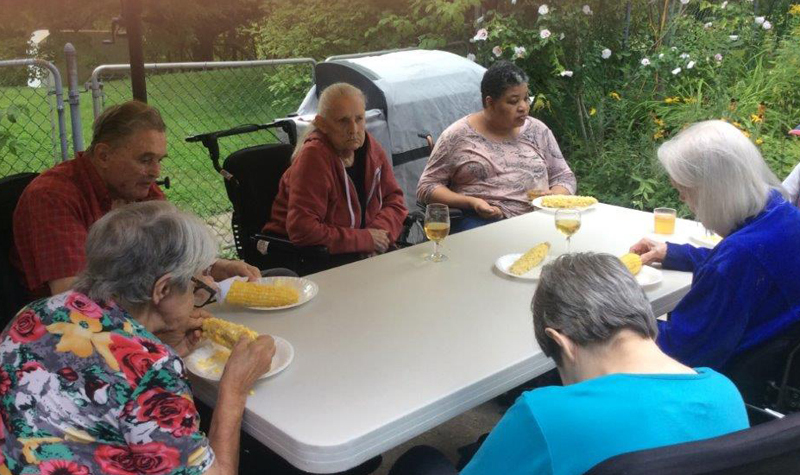 Willows Estate residents recently enjoyed a “corn roast” and some people enjoyed two or three cobs of corn. And, the event was such a hit, residents are now asking for an encore before summer’s end. Willows Estate hosted its first gathering for the Aurora long-term care home residents Aug. 31 on the home’s patio. At least 20 residents took part and 48 cobs of corn were consumed. “It was such a huge success,” life enrichment co-ordinator Teddy Mazzuca tells The OMNIway. On the day of the affair, amidst beautiful weather, residents who wished to participate gathered in the long-term care home’s kitchen to husk the corn. The corn was then cooked in large pots of boiling water and prepped to be served outdoors. The cobs of corn were purchased from a local farm. Teddy says it has proven to be an especially good year for flavourful corn on the cob. At a residents’ council meeting Sept. 6, residents requested another corn roast before the summer officially ends in a few weeks.